The unique landscape of the Burren and the Cliffs of Moher on Ireland’s Wild Atlantic Way is the subject of a new book by one of Ireland’s leading photographers. This Is The Burren, Carsten Krieger’s photographic ode to the world-famous region, will be launched by Rose Hynes, a native of North Clare and Chairperson of Shannon Group plc, in Hyland’s Burren Hotel, Ballyvaughan, Co. Clare, this Sunday (November 29th). The Burren and the Cliffs of Moher, which was last week designated UNESCO Global Geopark status, is amongst Ireland’s most enigmatic and magical landscapes. The 176 photographs featured in This Is The Burren capture the essence of the Burren, including its weathered karst landscape, the ever-changing light; the exotic flora; the elusive wildlife; the tombs, cairns, forts and churches, and the people who call the Burren their home. Carsten Krieger, who was born in Germany, visited the Burren after learning it was the inspiration for J.R.R. Tolkien’s Middle Earth. More visits followed before he and his wife finally decided to move to County Clare to be close to the unique landscape. Carsten returned to the Burren to take more photographs in 2011, a project that turned into his new book. “Although four years sounds like a long time I could easily have spent another couple of years exploring and photographing the Burren, and most likely will do so. Every trip brings something new and unexpected and a reason to return another time,” he said. “We are delighted to have been able to support Carsten and the publication of this book which demonstrates the enormous wealth of history and geological significance associated with the Burren and Cliffs of Moher,” commented Carol Gleeson, Project manager, Burren and Cliffs of Moher UNESCO Global Geopark. 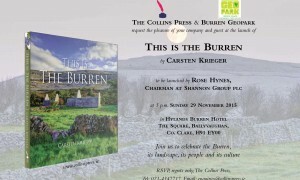 Carsten Krieger’s This Is The Burren, which is introduced by local author and broadcaster P.J. Curtis, will be launched in Hyland’s Burren Hotel, Lisdoonvarna, Co. Clare, this Sunday (November 29th) at 5.00pm. The launch event will also feature musical entertainment from Jim McKee & Band and the Jaskane Café Trio. This Is The Burren (The Collins Press) is available in all good bookstores and online at www.collinspress.ie. Carsten Krieger, based in County Clare, is best known for landscape images but he is equally successful shooting portraits, wildlife and events. One of Ireland’s most published photographers, he has photographed, written and contributed to ten books on Ireland’s landscape, wildlife and heritage. He regularly works for local tourism and media and contributes to the online photography magazines dpreview.com and slrlounge.com.